and with February, comes the first hint of Spring! Happy February! It's the best month of all! My birthday month! Whoo hooo! What a beautiful day for the first day of February, also! Isn't it the bomb? I woke up this morning and went to have my hair done for the first time in ages. Girls should be able to have their hair done. But, instead, I've been paying to remove spinach from my drains! That's not nearly so much fun! I keep thinking, as I get these problems resolved, one by one, about that commercial that says, "What's a pretty girl like you doing in a place like this?" And, it shows a nice lady scrubbing an oven. Yeah, that! I want to be in the beauty chair, instead of cleaning insulation out of my radio knobs, or trying to get the deep scratches out of my new bamboo flooring! Yesterday was a wonderful day of fishing the Kilchis. Four people, fishing hard, and not one fish to be seen. Even so, the day was magical! Andrew and I have had a wonderful cardiologist caring for us, for over 20 years. His name is Dr. Menashe and we always thought the world of him. In fact, when my aorta dissected, I was in shock, but I told the surgeon at OHSU that I was NOT going to have surgery until I had the OK by my cardiologist. "Um, Jennie? You are dying. You WILL have surgery, and NOW!" I giggle at the thought of me saying that. I certainly don't remember it, but I guess I was a bit sassy with the surgeons, insisting on my good Doc's presence. I do think I got to see him, though, before surgery! I do think I did! If even in my dreams! I can't remember, actually, but it seems like they did call him, and I did see him! The good Doc Menashe always promised he'd come fishing at our home. He did! Yesterday, he brought a fellow Doc and came to fish! It was so fun! He brought a bottle of Merlot as a gift, and lunch that his wife had made, for all of us to enjoy. What a fun day! They were avid fly fishers, and Bill and I just used our standard bobber and jig set ups. I figured, that between the two methods, we'd for sure hook up. We didn't, abut you know what? It didn't matter! At least to me. Sure. It would have been all the better, but the day was so warm, and the smiles came easy. It was just a great, relaxed day on the river, and at the kitchen table, for breaks. I felt badly about it for them. It sure would have been nice to send them home with a nice Kilchis River hatchery fish. It's a bit late for that, but I thought, "maybe..." No luck. But, that's fishing! It is such a treat to share this beautiful land with other people that appreciate the same kind of thing. I had to go grab my rod from the fly tying room, and I said so, while we were getting ready to fish. That perked the interest of Dave, Doctor Menahe's fishing friend. When he followed me, he said to me, "To have a fly tying room is wonder enough, but to have one with a view of the river? That's fantastic! It makes me realize just how lucky we are. The dogs ran free, and everyone was just as happy as we could be. I think everyone, (including the darn chickens!) had a good day! I want more of these kinds of days! I'm so glad for life's troubles, and I know that sounds odd, but because of the trouble I know, I appreciate the good days, so much more! Reminds me of this, which I recently read on Facebook. It sure touched me. I hope you enjoy! I wish you enough "Hello's" to get you through the final "Goodbye." The other day, I was feeling a bit blue. I took my Mother's advice. That is always a good thing. Mother's know best. I went to the store and bought a pack of gift cards in the card section. I'm lucky enough to not be able to afford the amount of gift cards I needed, but I found a pack of twenty, knowing full well that my hand couldn't stand to write more, if even that many! I find it amazing how I type so much these days, that the muscles in my hands can't withstand the pressure of holding a pen for long. My muscles have forgotten how, and easily tire. But, yet, even though I don't play piano as much, I can still play without the pain that happens while writing. Weird! I sat down to begin my expression of thanks to people that had touched my life, recently. Darnit, but I couldn't find a pen that worked in the entire house! I searched my old desk drawer, and they were all dried up! In my purse, in my pen holder, by my computer desk. Nowhere! Nothing but big, felt tipped pens that I use for ifish and for mailing decals and such. Finally, I found a nice pen in my car that I had been given at the bank. Not having a working pen is but another symptom of typing too much... of communicating via the computer, rather than by hand. I didn't like that! I don't send letters often enough, darnit! Typing is such a cold way to reach out, I think. Don't you? Bill's house has pens. He dislikes computers. Maybe he is onto something! I used to keep a pack of thank you cards at the ready, by my desk. I'm going to do that, once again. It only takes five minutes to jot down a note of thanks to whomever has touched you, the day before. It's a great way to start your day. Anyhow, I sat and wrote 20 thank you cards to people that I could think of, off the top of my head. About half way thru, I felt this feeling creeping up and over me. What was it? By golly, it was... Pure joy! Magic! Frankly, I need a pack of 1000 cards, though, if I were to really do the job up, but good. Can you imagine how I'd feel, then? Whoo hoooo! "I found a new drug!" After my Christmas present from the ifish community, I feel indebted and yet so appreciated by so many! I don't know how in the world I could ever thank everyone! But, I can try, if I only knew who and where to send the cards to! I could do one a day, till I'm done? I'm so afraid I'd miss someone, if I tried! Oh, that's a poor excuse! I recall once, asking my long lost friend, Ginny, if I should write thank you's to everyone that donated, during our ifish fund raiser. She talked me into it. Do you know how many people sent in a couple dollars? But, I did it, darnit! Every last one! Thank you, Ginny! Anyhow, when we were little kids, we were taught to write Thank you notes after Christmas and Birthdays and frankly, after any expression of kindness. Thank you, Mom, for teaching me right! Where is my Mommy? I miss her, so much. She taught us to write thank you cards, and also, that when we were feeling blue, to do things for others. Things like going to play piano at a nursing home, or going to serve dinners to those less fortunate. These are lessons that I am so thankful for. Try it, sometime! I'm sure that you were taught these things, too. I think that is why the ifish community is so special. Our community "gets" this type of thing, I'm certain. You are my type of people, you know, and I love you so much! All of you-- Red and yellow, black and white, you are precious in my sight! What a gorgeous day, it is, today! Makes for an easy feel-good, doesn't it? We may take off and do a late float down the Wilson. I have got to catch a fish, soon! Not a bite for me on the Kilchis, nor for Bill! It's weird! Usually we have several by this time. It's partly due to the fact we haven't wet a line enough, but is it a tough year? I think so! Enjoy the sunshine, build a list in your mind of those that have touched your life, jot them down on your iphone, (that's what I did!) and then sit down and tell them about it, by sending a card. Surprise someone you love. Mail is always a good thing! No one knows our Pacific Northwest like Grant McOmie. He is chock full of information, and again, it's time for him to share it with us! I can't wait to get a copy of this book! 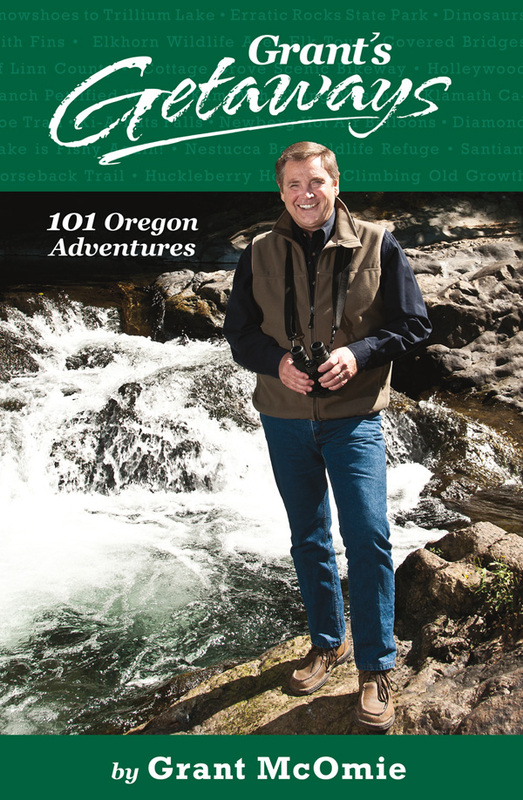 Fans of the Emmy Award-winning television series "Grant's Getaways" (produced by KGW and Travel Oregon) can now follow in Grant's footsteps with this comprehensive guide to some of the best adventures in Oregon. Grant explores family-friendly destinations and day trips across the width and breadth of Oregon from popular adventures to little-known gems throughout the state. Grant’s Getaways: 101 Oregon Adventures has an outdoor adventure for everyone and is of value to: Oregon residents, tourists visiting Oregon, outdoor enthusiasts (fishing, hiking, nature watching, and more), armchair travelers, as well as Oregon tourism companies and organizations. The book is organized by the month in which the television segment was filmed, and features 75 photographs by Jeff Kastner. Also included are travel tips such as “What to Know if You Go” and “Best Time of the Year” as well as access information. I can only imagine how much value this will have to fishermen and women in the Pac Northwest! Thank you, Grant! That's the show that he featured me on, not too long ago. I had so much fun working with Grant and Jeff Kastner. They are such a talented team and I learned so much, just be chatting with Grant! He knows more about my Great, Great, Great Grandmother, Tabitha Brown than I do! Off to go get some crab! Whoo hooo! It just feels so weird not to post, sometimes. It's like my life isn't quite right, when I don't enter things in a journal, no matter where it is, ifish... or an old notebook. When my life is hectic, and I don't have time to write, things go whacky! I don't know if it's because I'm not writing, or if it is because my life is just busy, and things go whacky when you can't have time to do things right! I don't know! Either way, I have to say that my life is whacky, lately! It's the show! No wonder, huh? Anyhow, during the show hours, we have the web cam up and it's so much fun! The kids on the discussion board are having fun with it, and so am I! It's right here, if you want to take a peek! I'm just so tired. I am not cut out, lately, actually, I never have been... for doing 40 hour weeks. I used to wonder, as a young adult why people could party after work. I was always dead tired. I didn't know much about marfan then, and I knew no different. It was just that I couldn't keep up with my friends nor my friend's schedules! But, I'm going to do this week. At least, it is mostly sitting! I can't do all day, but I have been doing pretty well for me! If you want to stop by and say hi, I'm there in the mornings and early afternoons. I don't stay at night time. I'm tucked into my little bed, at that time! Willie and I are snoozing! I'm having more fun at the show. It makes me smile to see all the ifish people. You know, I get upset at what is posted on ifish, sometimes, but I gotta tell you, these are our people, and without you, ifish would not be! So, I just love you all, so much! Working at the show is my opportunity to tell all of you how thankful I am! Thank you, people! I would love to shake your hand! So, come on down to the show, and say hi! Oh, my. I can't walk. Well, barely! Remember that Grandpa on the Carol Burnett show? Uh, huh. That's me. (Or was it Grandma?) Anyhow, tiny steps. I slept fitfully because I was so sore. Still am, but I'm awake, now! I woke up! Fell asleep watching the Grammy's. Wasn't Taylor awesome? And Carrie Underwood was so good, too! I just love them, both! I woke up at 4 this morning, with the TV still on. Turned it off, rolled over, hugged my Willie-dog, and slept till 6:30. Made coffee for Tammy and I, and got to work. I was so happy I was done with the show. Still, there is a kind of sadness, as I drive off. I think it's not knowing if everyone I saw and hugged and am so used to seeing, will be there next year? I just love my row 1200 people that have booths by us. We get to be kind of campy. :) I just love that! You share things, and laugh, and get tired together. It's so good to work with the moderators and get to know them better. Thank God for Pete and Ampersat, especially, who took so much time out to help! Thank you and so much fun to work with the ifish members, too! I must write thank you notes, now! To everyone! They all deserve it- and more! Thing is, I was happy to be done, but now it starts a whole nother set of things to do! It just never ends! So, I need to write thank yous. I need to put up for sale the lures, on ebay. I'm doing this, this way because there are some naughty people who bought lures, took away the opportunity for others to buy lures, and they are selling them on ebay for bid, and getting a ton! I just can't believe some people would do that, and especially ifish members. :( Makes me sad to think about it. I mean, all is fair and legal, I guess, but it's just not nice. I mean, I could do that! I could take the ifishers money and sell these for a whole bunch! I could! I need the money! I do! But, I wouldn't. I just wouldn't. And, I won't. Leaves a bad taste in my mouth. Speaking of such... I do have a bad taste in my mouth. I've been taking really strong antibiotics all week, and I think I have that thing that babies get. Thrush? Yuck! Time to eat nothing but yogurt. I love that Fage yogurt. Try it? It's so good!!! I could live off of it, and I think I will! My sinus infection is going away, and just like work, when one things gets finished, another set pop up! So, it's thank you's and ebay, and ordering stuff for the salty dogs, and now that I have time for Willie, it's off to the puppy park. All I want to do is go back to bed and watch movies! That would be so nice! Even for one day! But, the house needs cleaning, too. Argh. I refuse, however, to start the "When I'm done with this, I can have fun!" -way of thinking. Life IS what is happening right now, and if I'm not satisfied with right now, I'll never be satisfied! So, I'm going to have a ball, a party, so much fun- writing thank you's, putting up ebay lures, cleaning house! Whoo hooo! By golly, I'm going to whistle while I work! But, for right now, can I have some more coffee, while I dream of sitting on a sunny beach in the Bahamas? Bill- I miss you, so much! I will be at the coast, later this week! I wish that I had more left, but I got thru the show, which is the main thing, with 50 left over. I'm sure sorry that not everyone will get one, but you know, I did my best, and that's the best that I can do. The thing is, it's fun to have it limited, but this, I agree, is too limited. But, thanks to those who buy a bunch and put them on ebay, next year, it will be limited to all. No one is going to buy 24 of them, like in past years. No one will be using that many, anyhow. The only reason people will buy that many, is to sell them. A limit of 6, will probably be the most you can have. Still, the people that want to beat the game, will have others pick up six for them. They'll still do the darn same thing, because people who want to cheat, will find a way. Darnit, anyhow. Makes me a bit sad that folks are like that. No, makes me really sad. Good Day! It's Love Day! Show love to everyone you come across, today and it will be an awesome Valentine's for everyone! That's what it's all about! I just went for a long walk on the river with the dogs. It was so nice, and yes, they showed me much love! I returned it! I'm going to surprise someone, today. Just don't know who! But, it will come to me! It's fun to do to someone you barely know, so that they don't suspect it! Then, you go make a basket full of goodies for them, and just say, "Happy Valentine's Day!" Oh, it's so fun! I gotta go do it. Have a great day! Now.... who will it be!? and..... it's time to go fishing! Yeah, yeah, springers are here, but I'm going after Steelhead! I'm a few fish behind, this year! I have to catch at least one steelhead! Besides that, springers show up at the coast much later than they do in the valley! It's fun to listen to my neighbor in OC take off for fishing every morning, though. You know, last time I was here at the coast, Bill and I planned on going fishing. He got the boat out, hooked it up, and there it stayed, hooked up for three days. Every single day we found something else to do. When Bill finally unhooked the boat, to put it away, I cried! We failed! What's up with us, anyhow? This time, we are going! Thing is, I'm terrible! I can't stand to leave Willie behind! I know we need time apart. I know he'll love me just as much when I get home. (If not more!) But, he's got separation anxiety, and by golly, I think I do, too! But, I'm going to do it. I have to. I must! Bill and I are going to float down the Wilson and Willie is going to be in the pen. Oh, this is going to be tough on me! So. Andrew is gone. Gone? How could that be? We-eeee, are never, ever ever getting back together. I drive along, on my way to the coast and it feels, sometimes, as if a knife is sticking through my heart. It hurts so bad! All of these "firsts". All of these songs. Everything about love lost, turns into Andrew lost. None of them are about a lover, but about my son. When it first happened, for the first months, I think I was in shock, because I couldn't cry at all. Now, the tears fall easy. I'm mad, now, and sad. Both. I cry and I scream. And that's alright. I guess it's "progress". I'm heading towards his first "Birth"day. Sure gives the meaning to the "birth" in Birthday. I gave birth to him nearly 26 years ago. I was overjoyed. He was my first. I wanted to be pregnant so badly, and my prayers were answered. Oh, Andrew! You were so tiny and so precious. I did nothing but care for you, as a baby. You sure kept me busy! I walk on the river, and remember how much he loved that river bank. I would be out fishing, and I could see Andrew walking out to visit with me. He was always such a tender soul. David would be playing the saxophone, and it echoed, clear out to every cast. Andrew always noticed the beauty in things, even as a young child. At the age of four, he'd say to my Mom. "Oh, Grandma! What beautiful plates!" He used such eloquent language for a child. I think that was because he couldn't see, so he listened, intently. Maybe that's why he was a musician, too. When he was in fifth grade, they said that his English was that of a high school graduate. Andrew never took a fishing rod to the river. He just walked over those rocks, with his headphones in, headed towards me. He'd take them out, and we'd talk there, on the banks of the river. Something about throwing rocks made him open up, more. I loved those moments. Those moments when he'd actually talk to me about things that were important to him. Sometimes, even private things. He'd have a friend pick him up, and go to the Kilchis park to hike. They spent hours up there, hiking, talking, and clearing trails. I was supposed to go, someday, to see their works in progress. I never did. I never, ever ever did. Last time I was here at the coast, I went to the park. Thank God that I ran into some folks who live down the road, because I was on the verge of totally losing it. Seeing and talking to them sucked my tears back in. I went for a hike, just before I ran into them. My mind wandered of course, to Andrew. 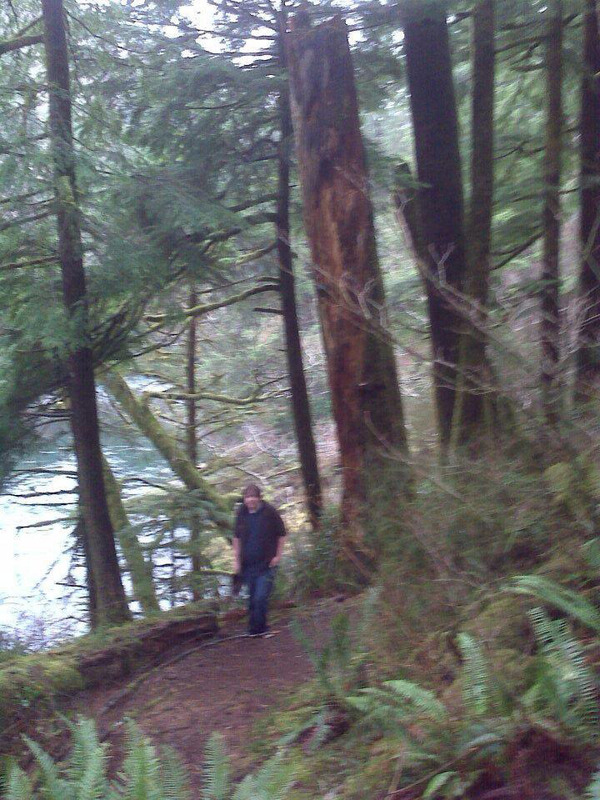 I wondered where he wandered, what trails he had made, what he was thinking, and how nice he must have felt, here. Peace. I hope he felt peace. His friend Dan wants to spread some of his ashes, there. I don't blame him. They were very good friends. I don't know. I don't know where I'm going with this. It's raining. I'm on the Kilchis, alone. Bill went to a Steelheader's meeting. I'm just very, very, alone. How I wish Andrew were here, with me. In the other bedroom, like he was, for so many years. I wish that I were out fishing, and that I'd catch a great big one, and that I would have to yell for him to prove it, before I released it. He was good for that! If I caught one, now, no one would know. 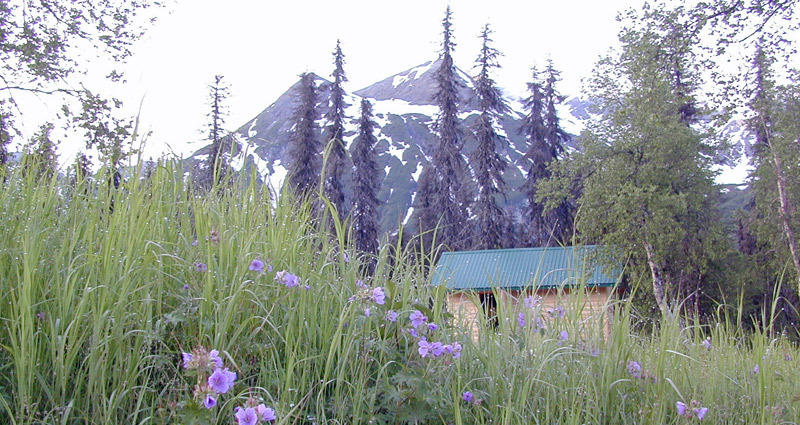 I wish there were berries growing on the vine, and I could pick some, go knock on his bedroom window from outside, and smile, "Berry fairy!" And he'd open his window, and get all excited about the fresh, yummy berries, and he'd pick one of the best ones out of my hand, and ask if that was alright. Of course it is alright. It was always alright. It was so alright. So, very, very alright. But, we eeee, are never, ever, ever getting back together. At least, here on earth. How's that for ruining a perfectly good song? Just checking, but yeah. Andrew is still gone. And, life goes on! I mean, you have to go on. I can make it miserable, or I can make it the best that I can. I choose the latter. But, dangit, sometimes it hurts, no matter what I choose! Valentine's Day was a bit difficult, and so will be my Birthday. All these "firsts". He was always so good about Birthdays. I will miss his thoughtful ways. Perhaps David will miss that about him, too, and take over. I hope so! Now, when it comes to Andrew's Birthday, I'd like to get out of dodge. Just skip that day, please. August 12th won't happen this year for me. You know, when I decided to get pregnant with Andrew, I considered that I had marfans, and could pass it on. But, I only thought about how his life would be affected. I thought, "Well, I'm glad that I lived", and used that as permission to have him. I never, ever thought about his life being cut short. Why didn't I think of that!? My Mom started a Valentine's tradition of making fudge hearts, about 10 inches diameter or... "heartameter" around. They were in a tin foil mold, and covered with plastic wrap. All of us got one, including my Dad. Every day after school, after Valentine's Day passed, a common cry would erupt, "Who got into my fudge heart?!" I mean, gag! Who could eat more fudge than that!? Um... OK, it was me! I love fudge! It's cold. You know what? It's my Birthday on the 23rd! I'm going to be 53! Isn't that awesome!? Oh, my, but I never thought I'd grow this big! 53 is BIG! Whoo hoo! The doctor's were wrong! Na na na na na naaaaaaa! I'm alive! And I'm OLD, to boot! I never thought I'd be old! I'm loving it, and I'm going to be older than this, too! You wait! So, from my 53rd Birthday on, I'm going to try harder to follow the 10 pound rules that they gave me. I really, really do want to be old! So many people don't want to have or mention their Birthdays. I just don't get it. I mean, I get that we don't like the pains of being older, and the fact that the cold bothers me more is no fun, but hey! Like my Mom used to say, "I don't like the alternative, either!" So? Let's celebrate! And, like my sis Teri says, "If there is reason to celebrate, we will celebrate!" There is too many sad times in our life when celebration is out of the question, so by golly, Birthdays, Christmas, anniversaries of good things? Anytime we can celebrate, we will do just that! And... this just kills me! It may S N O W on my Birthday!!! Oh, I would just giggle like crazy! There is something about snow that makes me feel 12! Whoo hoooo! It's so funny. As we all know, I'm a Taylor Swift fan". I joined this discussion board for swifties. All these members, they are like 9-12 years old and some a little older, and then, there is "Grandma!" Me! Swiftyoverfifty! That's, me! Those kids are so kind to me! They put up with me, but I do wonder what they think of a Taylor Swift fan that is 53! I think I have to be the oldest member! I must be! Cracks me up, but I love it there! The other day, I watched Taylor Swift Youtubes for 2 hours! I must be losing my mind! But, it was so relaxing, and she is so awesome! She is sweet, funny, real, giving, or... she used to be. Some part of her, -the child like part- reminds me of me, or who I would like to be, anyhow. I can't decide if the new "22" Taylor is growing out of that or not. I'm not so sure I like the new Taylor as well as the curly blonde haired, innocent, wide eyed Taylor. The music, or the gal. I guess everyone has to grow up. Right? That is, everyone, but Andrew. He'll forever remain child like in my heart. I had a great Birthday! Hey, the day after my Birthday, the 24th, always reminds me of my Grand Father. He was so awesome, and his Birthday is right after mine, so we'd often celebrate together. I loved that. As if it were yesterday, I would sit on Grandpa's lap with a candle lit Birthday cake that we both blew out, together. I love you, Grandpa! Take good care of all my loved ones! I learned my love of fishing from my Grandfather. Read his writing, here. I cried at the thought of last year's Birthday. My son Andrew and I were having an argument, and he was out driving with friends. David asked for a ride to the store, and when Andrew asked what for, David said he was going to buy me a Birthday cake and presents. Andrew hadn't realized it was my Birthday, and I guess felt badly, so they both went, and came back home with goodies. We all kissed and made up. On my drive yesterday, from the city toTillamook, I thoroughly enjoyed watching the Wilson river as I made my way. Rivers belong to all of us. Isn't that awesome? That song, "This land is my land. This land is your land." repeated in my head, but I replaced "land" with "river". .I wanted so badly to stop, to take pictures as I made my way, but Willie was restless, and I decided to hold off. He loves going to "Revvie at the river". I wanted to take pictures of how grand the Wilson appeared, as it flowed over a wide swath of rocks. The water, as wide as a football field, sprayed up into the air, as it slammed, powerfully onto the boulders. In my mind, I clicked a pic of a fisherman, standing by his truck, with his hands on his knees, tired after a hike up to the road. His fishing rod was resting against the truck. I could just totally feel what he was feeling. The cool air, a random raindrop falling hard on his head, dripping down his face, the exhilarating music of the wild river filling his ears. Closer yet, I drove by the old Guide Shop. Trucks turning in and trucks turning out, to pick up or drop off their rigs and boats. I could feel the excitement of standing guard by the boat, in wait of partners, starting out on a day of fishing. Is this the first run, or the second? Thermos filled with hot chocolate or coffee, rolling around in the bottom of the boat. The nip of cold air that bites at your cheeks, but otherwise doesn't even touch you, because you are so pumped to get started! Can you feel it? I sure could! And yet the heater in my car kept on, solid, while Willie and I made our way. I turned into the drive, and as tradition has it, I opened my car door at the top of the hill to let Willie run to the house. "We are here! Revvie! Bill! We are here!" Willie beat cheeks down the gravel roadway. I get it. They dock Springer tails because they wag them so fast, they have been known to break. Now that's happy! Willie's tail let loose like an over wound rubber band on a toy airplane. He nearly did take flight! And at the bottom of the driveway, appeared Revvie, equally excited and eager to go. Revvie turns from the fireplace dog, sitting at Bill's feet, to the puppy she was, half a decade ago. Willie does that to her, just as driving along the Wilson river turns this city girl back into the fishing girl I was half a decade ago. I mopped up the bottle of water that went flying when Willie leapt out of the car, and we all took off down to the river. The three of us, wagging our tails. I gulped fresh air into my lungs. My ears filled with the symphony of the wild and untamed Kilchis river. Driving next to the Wilson for so long with windows rolled up was like reading a manuscript in bed. This musical manuscript was yet more familiar to me, memorized in my repertoire. Ah.... The Kilchis river. They all sound different, but there is always a familiar melody. -A variation on a theme. After we filled our hearts with home, we dragged back to the house. Greeted by a blast of warm air, we sat by the fire, and caught up with Bill. He turned down the television and I grabbed a cup of hot coffee. Home. Home on the river. Later, I pulled my covers up to my chin, opened my window and my ears filled with the river's music, as deep sleep came over me. “And forgive me, please dear Lord, for all my mistakes, and there were many. You know, Lord, that I dislike crowds and the likes with all their rabble and babble. I believe that perhaps, you have spoiled me a little by going with me on every fishing and hunting trip that I ever took. Many were the times, that just you and I, up some winding canyon, with nothing but hush clean up to the brim, save the low moaning of the wind in the pines and the music of tumbling water, interspersed occasionally by the raucous cry of a bird, who challenged not you, but me for being there. And how I loved and enjoyed all of it."